Ananse the spider is a greedy fellow. When he prepares a feast he doesn’t intend to share it. A hungry friend, Akye the Turtle, shows up on his doorstep, and Ananse feels compelled to invite him in. But crafty Ananse contrives — oh, so politely– not to give Akye anything to eat! Then Akye invites Ananse to dinner. It turns out Ananse isn’t the only one who knows how to prepare a feast, or the only one with a trick or two up his sleeve. 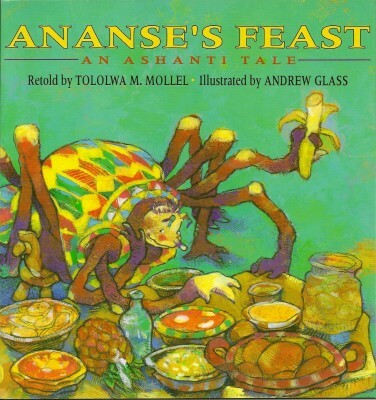 Ananse’s Feast is a traditional Ashanti tale from Ghana, West Africa, eloquently retold with the richly comic illustrations that are a feast for the eye. Ananse’s Feast has been translated in Korean. The earth was hot and barren and no one had much to eat except Ananse the Spider…and he decided to treat himself to a feast. Ananse shut his doors and windows and sealed all the cracks in the walls of his old hut. “I don’t want the delicious smell of my cooking to bring hungry visitors,” he muttered. But somehow the aroma of food escaped and reached hungry Akye the Turtle. With its well-cadenced text and witty, colorful illustrations, this picture book makes a rewarding choice for reading aloud.